Are you looking for a unique Easter craft? 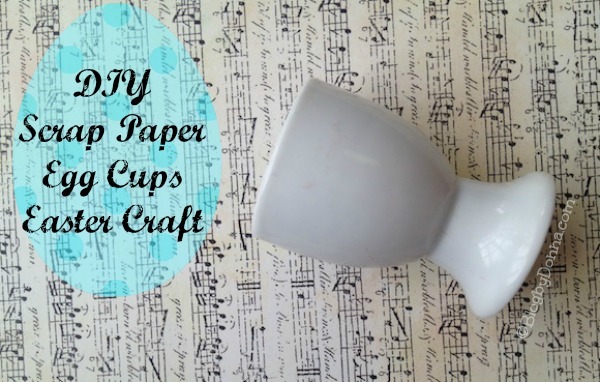 These scrap paper egg cups are the perfect weekend project. 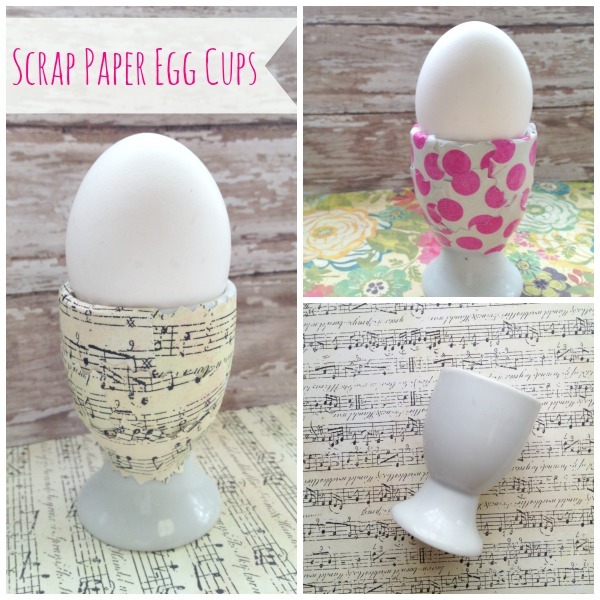 Easy and inexpensive to make, these scrap paper egg cups are a great way to add some color and fun to your Easter table. If you are hosting an Easter brunch, or just want some Easter charm around your home, take a look below at how you can make a set for yourself. You only need a few supplies, so before we get started I wanted to let you know that if you click on a link and make a purchase, I may make a few cents. Thank you in advance. We found everything we needed at our local Hobby Lobby store. Egg cups can be found in plain white for around $2.99. With the 40% off internet coupon, you can snag one for even less. Scrapbook paper can also be bought on a dime, ranging from .29-.79 cents a sheet. 1. Begin by cutting your scrapbook paper into tiny pieces. Pieces should be about an inch or less in size. 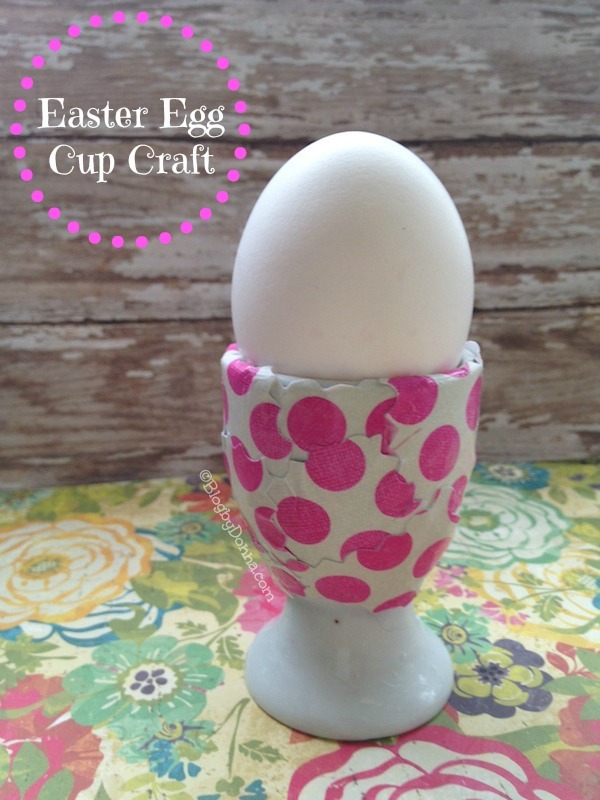 This will make them the perfect size for layering onto your egg cup. 2. 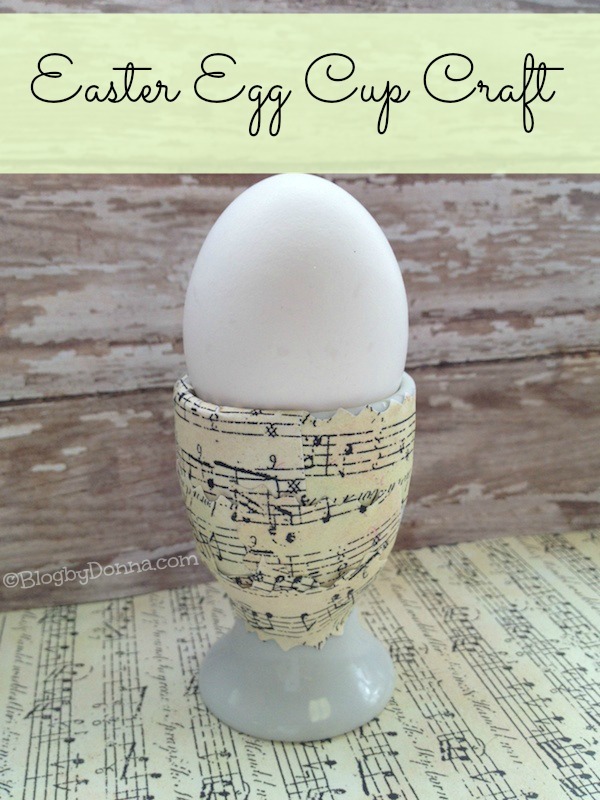 Dip your finger in some Elmer’s school glue and spread it all over one side of the egg cup. You only want to do one side at a time so it doesn’t dry out on you. 3. Press the tiny pieces to the egg cup, flattening them out as you go. Continue to layer on pieces until that side of the cup is covered. Repeat these steps on the opposite side. 4. Once your egg cup is covered, apply a thin layer of glue on top of the pieces. Don’t worry, it will dry clear! Allow plenty of time for your egg cup to dry now. Once it is, you are ready to use it. Display your decorative eggs in it or use it to hold hard boiled eggs at your next brunch. Either way you use it, it is a great way to add some simple spring charm to your home! I love this! !The musical notes one is definitely my favorite! This is such a great craft. I love the musical note one too! I’m more of an egg decorator than the cups, but you would have them for future years. I’ve never used an egg cup before, but those are cute! This turned out very well, and is such a neat idea. These are so cool. Very timely too with Easter just around the corner. Thank you! That’s a cute idea for some Easter fun. Very cute idea! I often wondered where to find egg cups. My grandmother always served my hard boiled eggs in an egg cup. These are so cute! I love that they could be personalized and kept for future years. What a fun way to individualize the cups and add some fun to the table! Beautiful! Makes me want to tap the shell of a soft boiled egg with my spoon while I’m enjoying a cup of breakfast tea. I’m classy like that. So cute! I am not a fan of decorating eggs, I would much rather decorate the cups. This is such a cute idea! you could totally use modge podge too! Very cute! I love the simplicity and it makes such a cute Easter decoration. These would make great gifts for party goers to take home with them. Very cute. I don’t think I own an egg cup. Glad you mentioned Hobby Lobby, because I wouldn’t even had known where to go to shop for some. Very cute. I especially liked the music note paper. those are so fun 🙂 I never thought about buying an egg dish like that to display our eggs. Great idea! What a great craft for Easter!! So cute! I really like the sheet music one. Aww this is really fun! I didn’t know you could get those cups at Hobby Lobby. I wonder if they have any glass ones. I didn’t see any glass ones at my local Hobby Lobby, Jesica. oh how cute 😀 i love this idea!! Such a simple but insightful craft. I can see my kids using pages of their favorite books for theirs. I love the music paper holder! What a cute craft! Okay, you can tell I’m not a crafty person because I’ve never heard of an egg cup until now. They are adorable that’s for sure. I can see me trying to paint them instead of putting paper on them. However, I think you have a picked some cute scrapbook paper to go on them. Neat craft!! Looks quick and easy. What a fun idea for a craft. These are pretty cute and creative! What an adorable project my daughter would love doing this. Those are so cute! I have a ton of cute scrapbook paper I didn’t know what to do with, I might have to make these. These are a cut idea or displaying and serving up eggs.